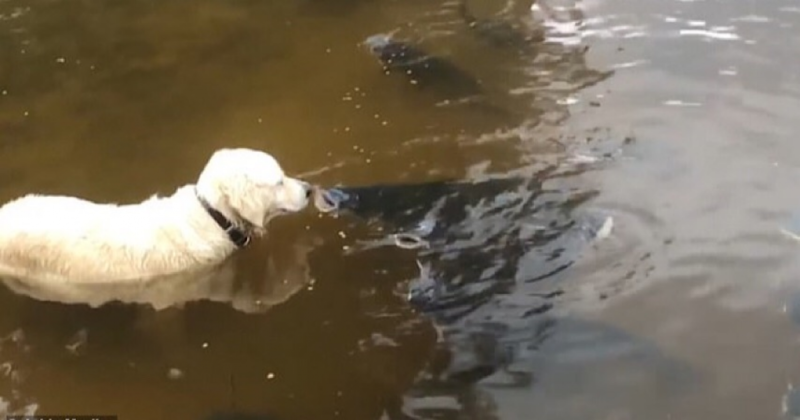 Patient Golden Retriever Expertly Snatches A Huge Catfish Out Of A Lake. If you want to catch fish you will need some instruments but a playful Golden Retriever catches a catfish in its jaws and drags it from the depths of a lake. The moment of the patience dog was filmed in Saltillo, Mississippi. Here the video shows Rani, the dog captured her huge catch as she stood knee-deep in water. Rani remained motionless when a school of huge catfish swam around her. It was a hard method of catching fish that is generally used by the ancient people. The Golden Retriever stood in the deep of water motionlessly for a great moment for catching fish. After her patience she got the opportunity to pounce. She grabbed a catfish in her jaws, walking backwards with it as it splashed desperately in the water. With the fish firmly in her mouth, Rani drags the huge catfish out of the lake and onto a grass bank. The catfish then began to flail wildly, kicking its tail as it attempted to move back towards the water. at last the fish reached the water but the dog did not show any attempt to catch the fish again.